ADD VINTAGE APPEAL TO ANY ROOM - Vintage-style suitcases add visual interest to any room. 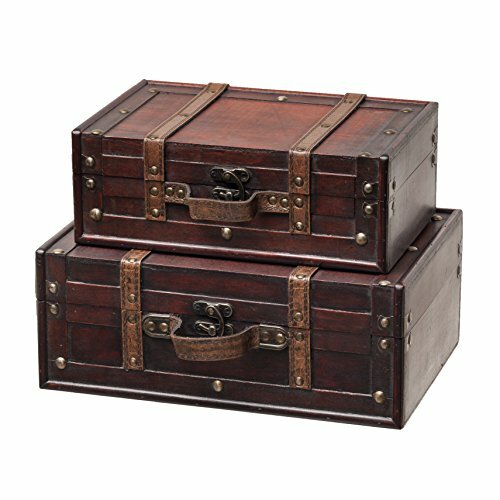 With decorative straps and linen, fabric-covered sides, this set of 2 suitcases will add a charming touch to any office or den. Place them under a glass coffee table or stack them and use them as a side table to hold some books and eyeglasses beside your favorite reading chair. DECORATIVE TOUCH OR GIFT BASKET; YOU DECIDE - Use these decorative suitcases as decor in an office or living room. With the gorgeous cream fabric, they add a fresh touch to a room. The perfect gift for the traveller, the recipient can use them to display or store souvenirs from their adventures. IDEAL AS A PARTY PROP, WEDDING DECOR, OR TO STORE ODDS'N ENDS - These retro suitcases not only look fabulous as a focal point in a room, they also provide great storage for media remotes, essential oils, indoor gardening tools and children's toys. The sophisticated cream fabric adds an elegant touch as a prop at a Bon Voyage party, baby shower or wedding. RETRO HARDWARE AND DESIGN - Durable plywood, faux leather and cream linen fabric suitcases have decorative hardware and straps for an authentic vintage look and feel.